For my final adventure in Alaska, I wanted to do something especially remarkable. It was just a few hours until my flight departed, but I was determined to make those fleeting moments count. 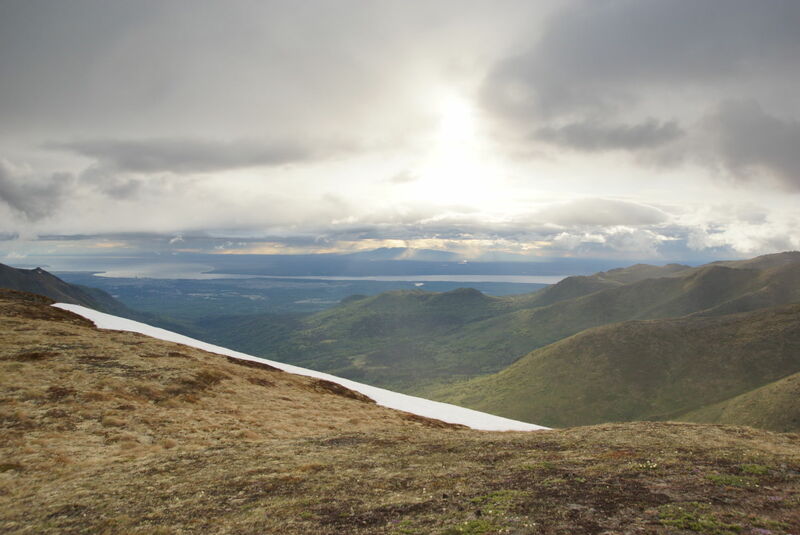 I set my sites on a hike to Rendezvous Peak, just northeast of Anchorage. I had read great things about Rendezvous Peak – specifically, how it was considered a “must do” hike on the same level as Flattop Mountain (which I had hiked on the second day of my trip – and loved it). 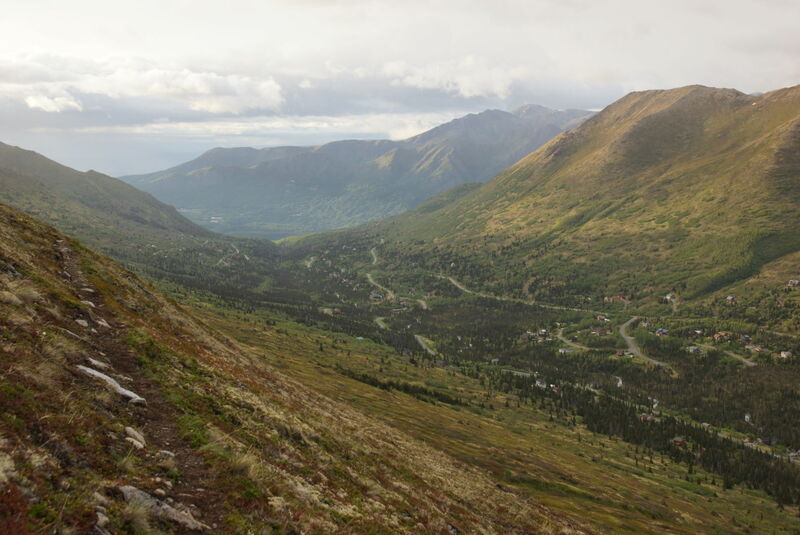 While Rendezvous would offer a similar leg-straining challenge as Flattop, this hike promised a city view and a nice perspective on the surrounding Chugach Mountains. 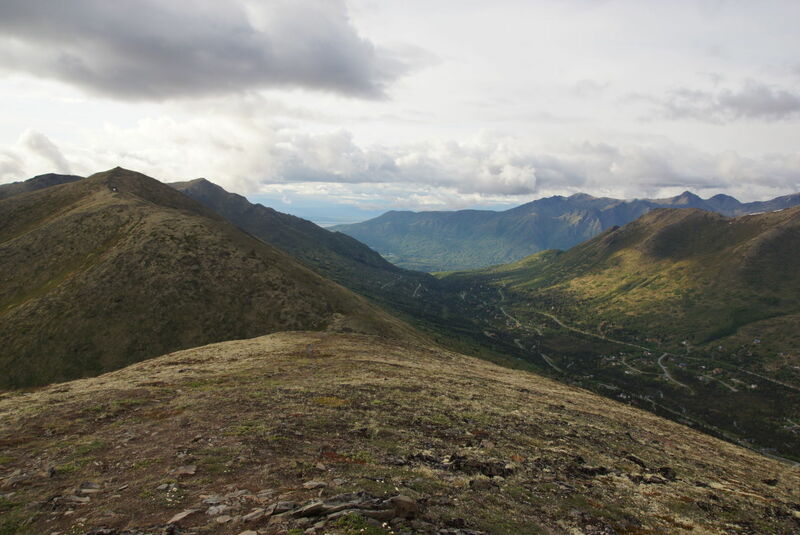 I simply couldn’t leave Alaska without saying I had tackled both trails. But there were problems. 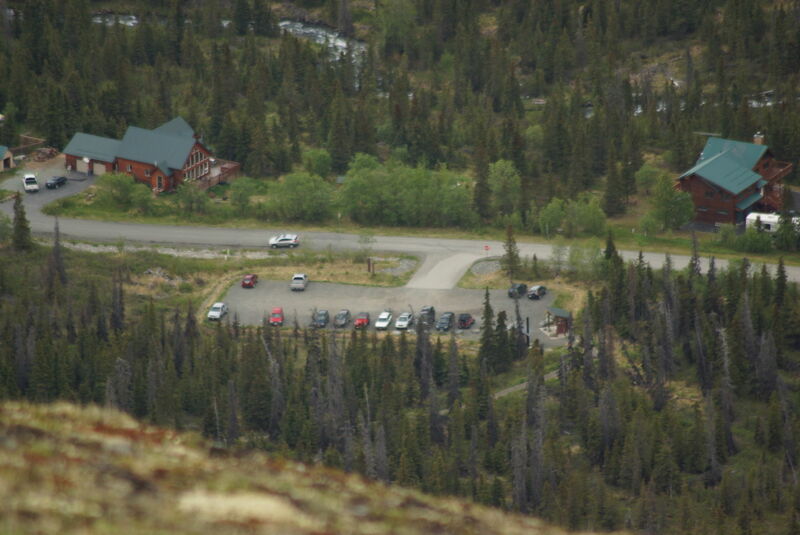 The easier approach to Rendezvous Peak requires admission to Joint Base Elmendorf-Richardson, via Arctic Valley Road. That gate is open from 6 a.m. to 10 p.m. (check with the base to see if this is still the case when you visit). I wouldn’t even be able to get to the trailhead until after 7. I couldn’t be sure I’d be done in time. 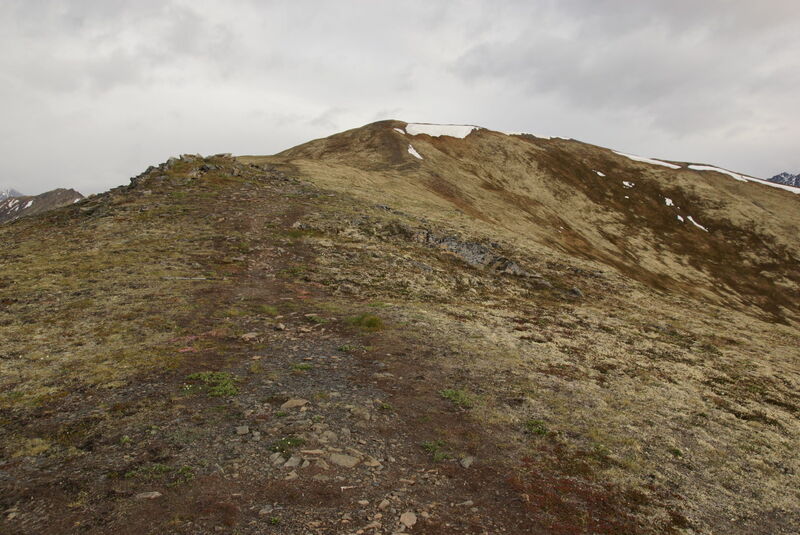 I decided to attempt the climb to Rendezvous Peak up an alternate trail – from the north side. This trail was slightly shorter but steeper than the other approach. 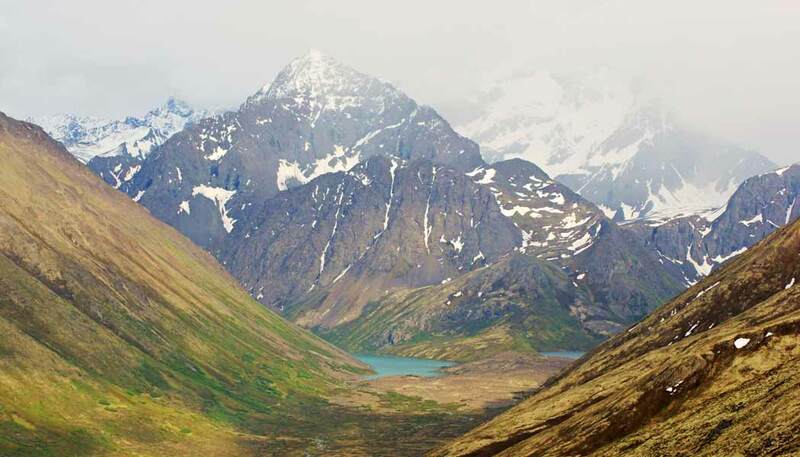 On this side, the first goal is to hike up to the saddle you see in the photo above. Then, you hike along the edge of the hill on the left, until you get to the top, and then you keep going. I can’t stress enough, the word steep. 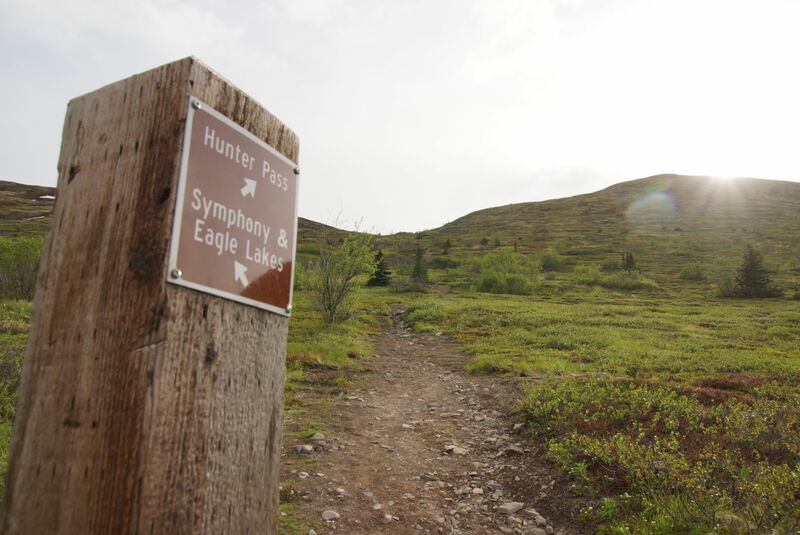 Not long after you’ve left the trailhead, the trail up to Rendezvous Peak splits off from the trail out to Eagle and Symphony Lakes – and it heads directly uphill. The climb is similar to walking on the roof of your house. Every step is almost like a stairstep – except the stairs in your house aren’t made of dirt, and you don’t slide backwards on every step. 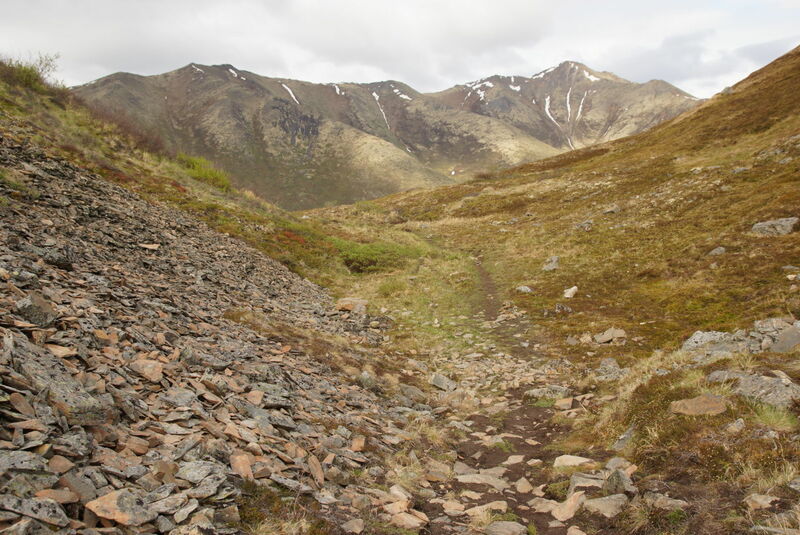 It’s a grueling climb to make it up to the saddle that bridges the gap between the north and south trails. Judging by the sign at the base of the trail, I’m guessing this saddle is called Hunter Pass. If you continued through the gap and on downhill, I assume you’d end up at the other trailhead. You can spend as much or as little time in the saddle as you wish, but eventually you’ll need to start climbing again. 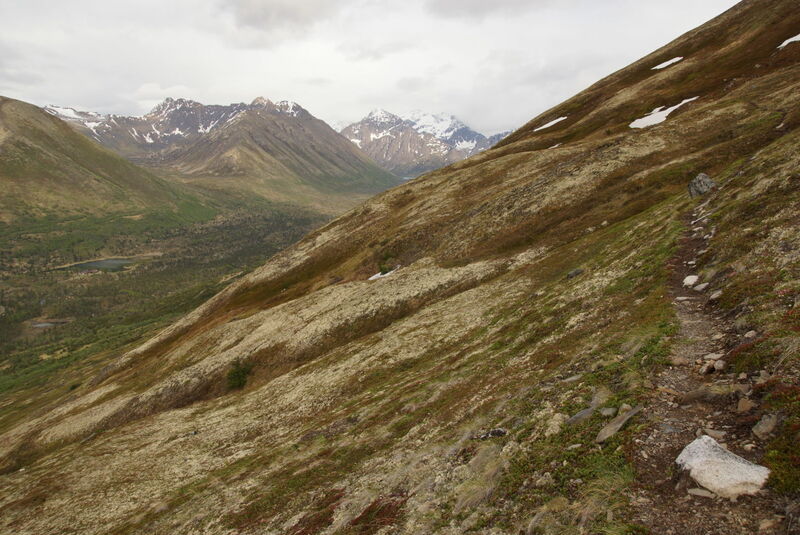 The trail that leads upward from the pass is faint. 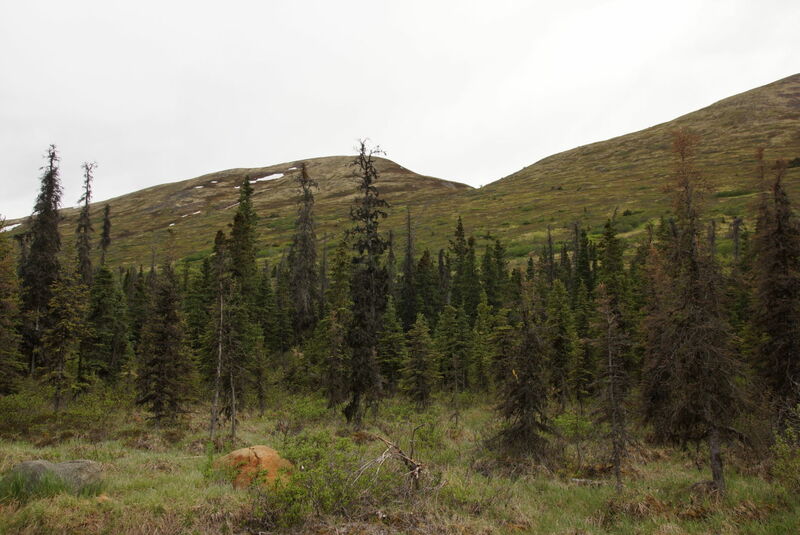 I didn’t know if I had found the correct trail, and I spent some time in the saddle, looking for other options. Finally I decided that the trail on the north side of the hill was the right one. 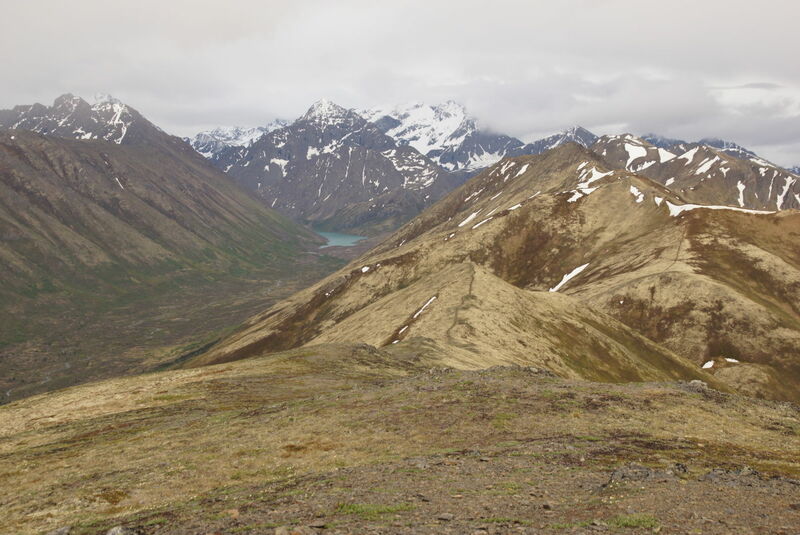 If you’re climbing up from Eagle Valley, like I was, you should see this trail as soon as you reach the saddle — no need to hike through the gap to the other side. This second phase of the climb is less directly uphill than the first part, but it’s still pretty steep. Can you see it there? All along the way, you’ll have increasingly good views of Eagle Lake in the distance, and you can also keep looking back at your car, as it gets smaller and smaller, at the trailhead down below. … this isn’t exactly the top. It’s a pretty satisfying achievement, nonetheless, but this ridge isn’t your ultimate goal. Rendezvous Peak is a bit further uphill, up the ridge. You may see an overhanging snowbank just below the actual peak. … and the surrounding mountains are quite good from here. In the distance you can see Eagle and Symphony Lakes. Next time, instead of tackling Rendezvous Peak, I’ll take the longer, less steep trail, and head out there instead. I believe I had mentioned that I didn’t reach the trailhead until after 7 p.m. By this point, it was almost 9 p.m. I had taken the climb very slowly, and wasted some time in the saddle, trying to determine the correct way to go. I needed to be to the airport by 12:30. And, it was cold, rainy, and occasionally the rain looked more like sleet or snow. I had every reason to turn back. But, this was my final Alaska adventure. I had to make it up to the top. 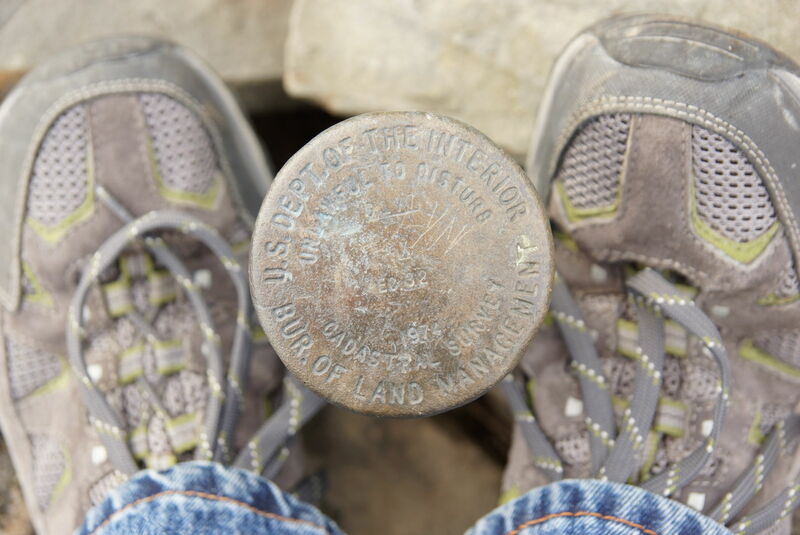 … to wrapping my feet around the survey marker at the top of the mountain. The views from the very top were still quite good, but the weather was growing more harsh. 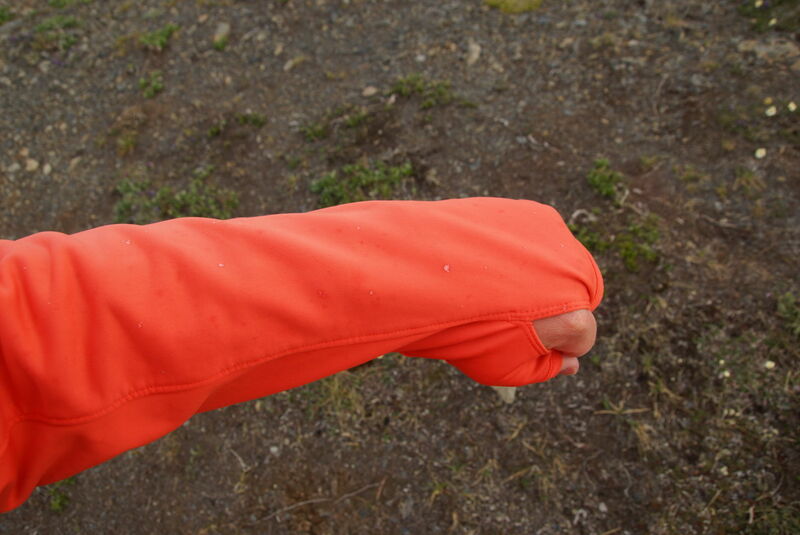 Maybe you can see a few specks of sleet or snow on my sleeve. So I took off, downhill. The descent was much, much faster than the climb. In fact, I made it from the top to the trailhead in 49 minutes. And then, all that was left to do was to leave Alaska. But at least I squeezed in one final accomplishment. 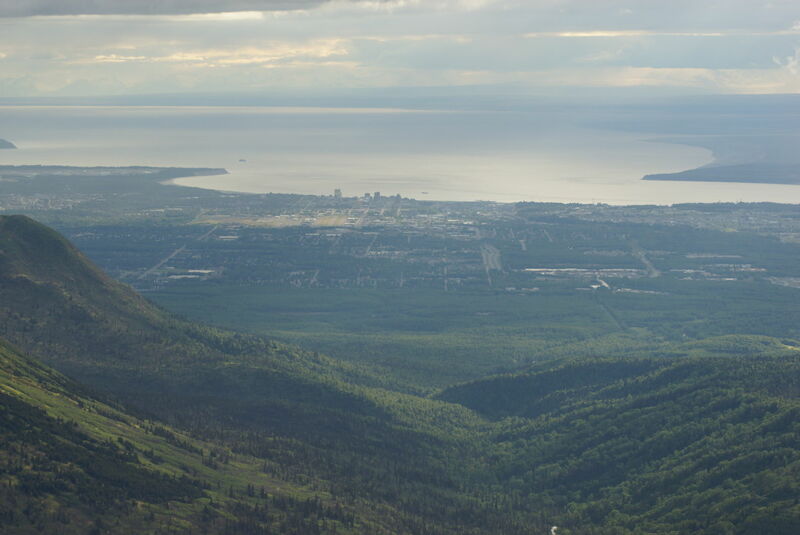 You can access the Rendezvous Peak Trail from the south side, via Arctic Valley Road, and the Elmendorf military base. Parking is $5, and your state park pass is not honored. Also remember, the gate might close before you’re done with the hike, on those long days in May and June. From the north side, drive out Hiland Road. Before you reach the end of the road, you’ll need to turn right on Creek Road, cross the creek, then turn right again on River Drive. Just past that intersection, you’ll find the trailhead. There’s no fee for parking at this trailhead. If you would have started from the Arctic Valley side, you would have been done in time. 🙂 It’s a really short hike up from that parking lot. Last summer, I did both Mount Gordon Lyon, and Rendezvous Peak and was back to the car in less than 3hrs, and I am no mountain runner. If you would have just shot up Rendezvous Peak (It would be to your right if you’re looking up from the parking lot)and back down, you would have made it out before the gate closure. 🙂 But doing it from the Hunter Pass side, now THAT is a good hike!